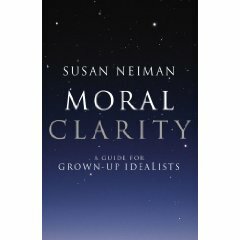 Susan Neiman’s “Moral Clarity – a guide for grown-up idealists” (2009) is a passionate and literary book about moral reasoning and the achievements of the Enlightenment (especially Kant). The book contains fantastic and acute re-readings of the myths of Job and Odysseus, as well as plenty of examples of Neiman’s own moral clarity – she has a great analyst’s knack of being able to articulate clearly and succinctly exactly what was so pernicious about many of the arguments and actions of the neocon government under Bush. Recommended. She’s written an excellent book on Evil.With this recommendation, I’ll look our for Moral Clarity. Any good references to Arendt (who she appreciates highly in the other book)?